Fishing Wader Repairs, Price Guide. All waders can be made to be different in many ways. Where we are asked to undertake a repair we will always do our utmost to put the waders back to the same condition as the original manufacturer (or better). We replace the original seam tapes like for like, so as to maintain flexibility and breathability. We are experienced in the manufacture of waders and watersports apparel so remanufacturing and doing alterations that are almost invisible is our speciality. Examples of our work are on our Blog and our Facebook page. Links to both are on the home page. Our repair experience goes back to the early 1980’s when the first variable volume dry suits were a real novelty in the sport diver market and we have seen many innovations and developments, all of which we have had to repair or put right. Our first made to measure waders were made back in 1984. Prices for repairs to waders assume that the wader is in original manufacturer condition and has not been modified so as to make repairs difficult in any way. We will always contact customers where the cost of a repair is going to be significantly greater than we have previously stated or where we feel that the wader is not worth the repair cost. We are happy to inspect waders and give a clear costing of the work that is required or the complications that may be involved. Some waders can be more demanding than others but not necessarily more costly. Please give us a call we can usually give a good indication of cost over the phone provided you can describe the wader and damage. We can repair seams, patch holes, make them wider, longer, slimmer, and shorter, add bits or take some away. If your divorcee partner takes a Stanley knife to your waders we can stick it back together in a professional manner; yes we have done this repair more than once! We are a small company so when you ring us you will always be able to speak to someone who makes their living from ‘hands on’ repairs and not a manager who merely watches without understanding. If you do not see a price for the job you require this is because we cannot possibly list everything and because some jobs are difficult to price until we see them (e.g. Mouse holes - an all too common repair). We do not offer credit terms on repairs, all items must be paid for prior to despatch. We use PayPal as a payment gateway. You do not need a PayPal acount. Professional Drysuit repairs, Wetsuit repairs, Made to measure Waders, outdoor sports apparel. 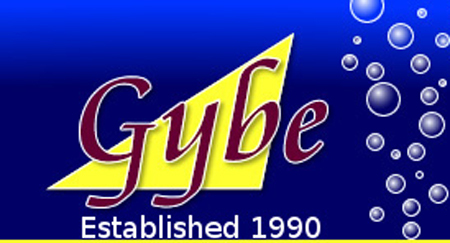 Gybe has now moved to new premises and no longer has facilities for personal callers at the workshop. Repairs can be posted or dropped off at the following addresses. © Copyright Gybe Sports All rights reserved.